Kenya has been losing an average of 255,000 trees daily. In the Mara River Basin this has negatively affected the rich biodiversity, livelihoods and wellbeing of thousands of local communities who depend on these resources. The aftermath of the recent rainy season has been unprecedented flash floods, landslides and destruction of properties, many of which is attributed to human related activities. To cushion local communities from the impact of environmental degradation and climate change, WWF-Kenya has been working with communities association like the Amala Water Resources User Associations (WRUA) to protect critical ecosystems. These efforts got a boost through the launch of #KeepKenyaBreathing campaign which aims to evoke Kenya's patriotism using the symbolic green on the national flag to call onto everyone’s to Bring back our green through planting 1 Billion trees in an effort that will facilitate the realization of the Vision 2030 target that will see Kenya return to 10% forest cover. Joseph Chebusit, Chairman Amala WRUA observes that the goal of the campaign is fitting to their work of reclaiming degraded forest and riparian protection. He notes that over the year’s forest degradation in the upper catchment has compromised the flow regime of the Mara River. Unsustainable agricultural activities in the upper catchment have further aggravated the problem resulting in high soil erosion levels and subsequent heavy sediment loads in the river. Whereas insufficient incentives to local communities to view conservation as a priority ranks high as challenges facing conservation, WWF-Kenya in collaboration with different partners are championing for benefit sharing modalities. With the grants support by WWF-Kenya, the Amala WRUA members have opted to pursue agro-forestry. “We have managed to distribute high value fruit trees such as the Hass avocado and tissue culture bananas to our members,” said Chebusit. With established market linkages the association members hope to export their produce in 18 months. Through the community effort, 20 kilometers of riparian land has been rehabilitated and some sections left for natural re-vegetation. These activities played a key role in increase the tree cover and reduction of sediment load in the Amala River, which is a main tributary of Mara River. 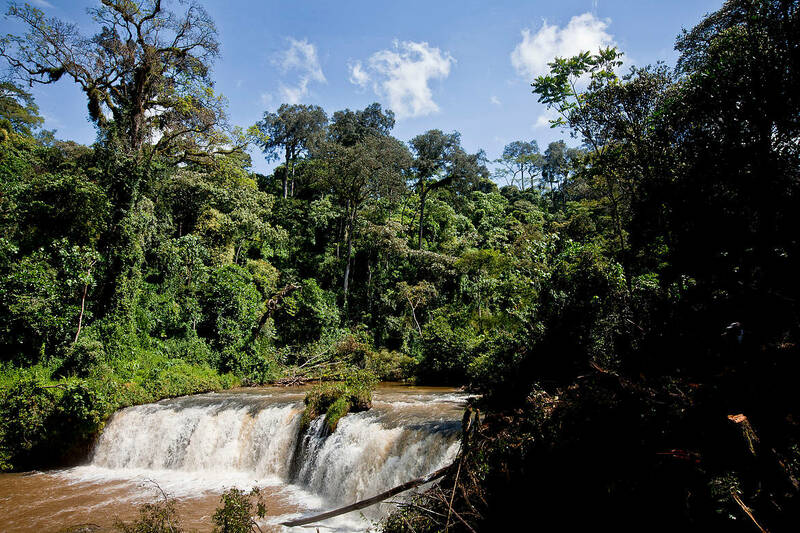 A waterfall along the Mara river at its source in the Mau Forest near Bomet in Narok, Kenya. The Mau Forest has increasingly been threatened in recent years due to deforestation and unrestricted use.